1H! Nagoya Aonami Line Sta.7 min! Property 1: 1H! Nagoya Aonami Line Sta.7 min! 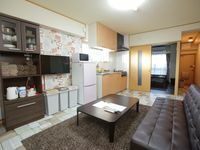 Property 4: You can experience Japanese local living! 4P. Nagoya Sasajima 7 min! Wifi! Property 6: 4P. Nagoya Sasajima 7 min! Wifi! Traditional house, Free shuttle Service! Property 15: Traditional house, Free shuttle Service! 這次是3個大人和1個小朋友一起自駕到名古屋玩, 一到民宿就很有日本在地的感覺, 房東的Koji社長非常的細心, 在去之前還一一確認看每個房間要怎麼鋪床. 還有我和小朋友睡的床還特別幫想到要準備雙人床墊和棉被, 剛好進入冬天, 除了暖氣之外還有瓦斯暖爐, 客廳的地板也有加熱毯, 每次冬天到日本很怕暖氣很悶過乾燥, 這裡溫度和通風剛剛好很舒服, Manager的Yuka san會講中文, 一到也跟我們用中文仔細地介紹每個電器如何使用, 客廳還放了兩台行動電話可以攜出使用, 如果有任何問題可以隨時請教, 也可以打國際電話和上網.....此行非常開心, 下次來名古屋還會來使用喔! this entity was around 400m away from the nearest subway, a little bit hard to find when we first check in, and there was no lift so we have to carry all of our luggages up to 3rd floor, the facilities and necessities provided to us was super complete, thanks to the host.